The three-legged stool is a metaphor for how the post-World War II generation looked at planning for retirement. The three legs represent an employer pension, employee savings, and Social Security. You need each one to build a strong retirement foundation. Without one, the three-legged stool would not function. This metaphor is often attributed to Franklin D. Roosevelt, who created the Social Security program. However he did not, according to the Social Security Administration, actually use the term. The origin may have been a man named Reinhard A. Hohaus, an actuary working for Met Life Insurance. During a 1949 speech on Social Security, he talked about a stool with three legs: Social Security, private insurance and group insurance. But the concept of three legs seems to have been very much on the mind of those who created the Social Security program. Does the Three-Legged Stool of Retirement Exist Today? For many of us, the three-legged stool no longer exists, or it at least looks a bit different. Pensions and group insurance plans once offered by employers are quickly becoming scarce. According to a report from Willis Towers Watson P.L.C., only 20% of Fortune 500 companies offered any type of defined benefit pension plan to new employees by the end of 2015. The number of employees covered by a pension plan has gone down considerably from the 60% who were covered back in 1998. 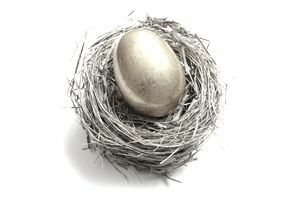 Many employers offer a 401(k) defined contribution retirement plan instead. But since employees are making contributions through their paychecks, a 401(k) is more a part of the personal savings leg than the employer pension leg. Some employers do contribute to their workers' retirement by offering an incentive match of up to 6% of what you save. The good news is the number of employers offering a 401(k) matching program is bucking the post-financial crisis trend. In 2008, around 72% of employers had a match, according to research from Charles Schwab & Co. based on the 1000 company plans their clients participate in. That number dropped to 67% in 2009 but was back up to 73% by 2012. If you have a match, then you have a small second leg to add to your stool. How Does Social Security Fit In? Then there's the important but often misunderstood Social Security leg. You can find all kinds of projection and opinion about whether Social Security has a, ahem, leg to stand on. According to the Social Security and Medicare Boards of Trustees 2015 Annual Report, Social Security trust funds are projected to be depleted by around 2034. This does not mean that Social Security benefits will disappear completely. Without any changes, the payroll taxes still being paid by younger workers will be enough to fund about 79% of scheduled benefits. One alternative to fixing the Social Security leg is that a combination of factors such as increased ages for full benefits or higher earnings limits will help fix it in some way. But as a result of these potential fixes to the system, the benefits may be drastically reduced from today's levels. So, depending on when you retire, you can count on a Social Security leg, but a small and weak one at best. The retirement stool of the future may have three legs, but they would probably look more like a large column with two small kickstands. The two small legs are there to add a slight bit of stability, but the main personal savings column is what will hold up your retirement. This is why it's so important to save as much as you can during your working years. The best way to find out is to run a basic retirement calculation at least once per year. A variety of different retirement calculators exist these days to help you run a simple retirement calculation to see if you are on the right track. Just be sure to include all of the legs of the three-legged retirement stool that apply to your personal situation.